Well, we've had a couple of posts designed distinctly for the men, so today's is mostly for the women and girls...rings, rings and more rings. I've got some other jewelry to post later on - necklaces, watches (mens and ladies), and vintage brooches (pins), but for today, just a few rings. 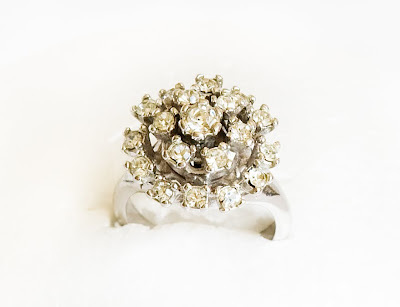 This rather large ring is silver with cubic zirconias in a round pattern. Designed after a dinner-ring style, it's meant for wearing at a fancy dinner party or large event. This one is about 15 years old, and still looks pretty good on the hand. 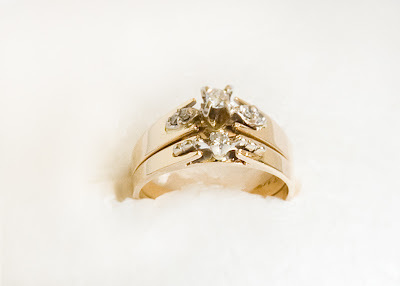 This wedding ring set has been seen on this blog before, in a velvet box. Here, they are viewed from the font, instead of the side. A delicate set with raised shoulders, these are 14 karat gold with single diamonds in both the engagement ring and wedding ring. 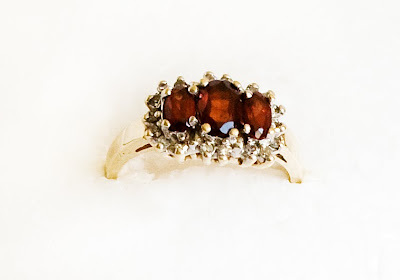 This antique ring was purchased from a local jeweler, who brought it back from an estate sale in England. 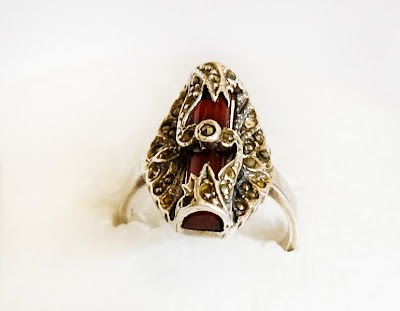 It is sterling silver (marked) with a rather Art Nouveau design and studded with marquesite. The red stone in a long tube shape is a carneilian. 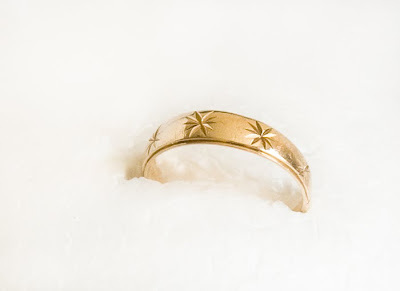 A simple 10 karat gold wedding band engraved with stars. Not terribly exciting in terms of glitter and sparkle; but sometimes the simple gold band can hold meaning far beyond it's looks. 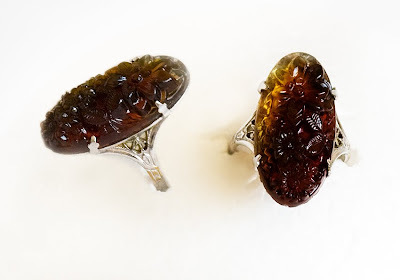 This is another piece from England - a sterling silver ring with filigree shoulders and a piece of amber carved with flowers. The style is decidedly Art Nouveau , though the jeweler wasn't exactly certain of it's history. 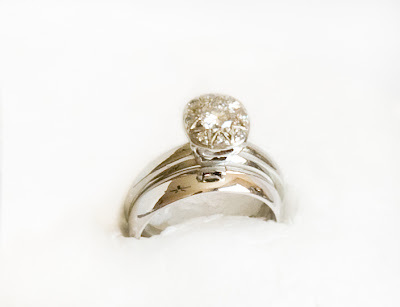 A white gold engagement ring and wider wedding band. The engagement ring is about 56 years old and was custom made by a little fellow who made and designed rings out of his home. "Harvey" made this ring for my dad when he became engaged to my mom. Except for one replacement diamond, the original diamonds in this ring are (so we've been told) an amazing quality. 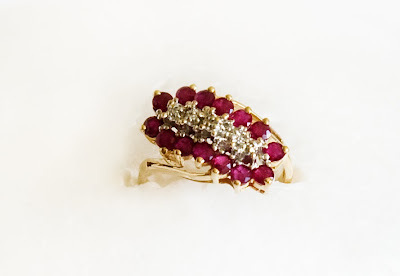 A 14 karat gold ring with three oval garnets surrounded by small diamonds. There are a lot of manufacturers that use this ring design in one form another, so it's been fairly popular for a number of years. 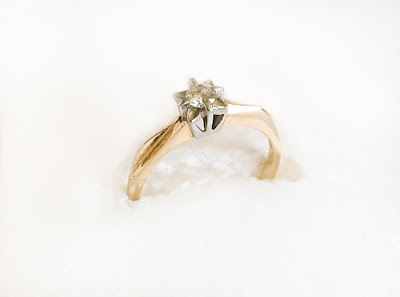 A square-shouldered engagement ring of 14 karat gold and a medium sized single diamond. This was purchased from an antique shop, and though the ring is older, it's more apt to term it "vintage" as opposed to antique. Though it is pretty, I've never cared for the squared shoulders...someday, maybe I'll see about getting something done with it. This delicate design is one of my favourites. 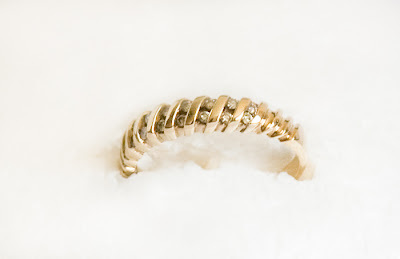 A 10 karate gold ring with delicate fittings and band, the curved shape is probably what draws me. The stones are rubies and diamond. 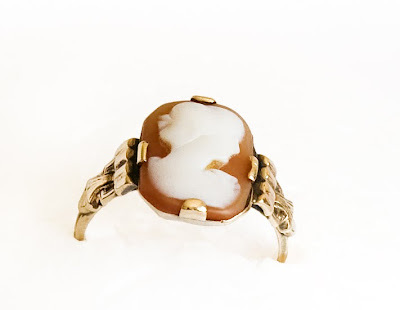 An antique cameo ring of dark peachy toned coral with white cameo. As you can see, it's very worn and this one is an antique - just about the 100 year old mark, in fact. This ring was an insurance replacement. My husband had got me a beautiful large cameo ring with pearls in the mounts that I loved. It was stolen in a break in and we could never find a replacement of similar style or quality. The insurance company insisted we purchase something of the same value they were offering. Most of the cameos in the local shops were lower priced, and since the insurance company wouldn't just give us the money, we tried to find one of similar price value. This was the only one, and it was more because of it's age that it's value was so high. I wear it sometimes, but mostly it just makes me sad because of why I even have it. A simple and plain, older (about 50 years old) birthstone ring. 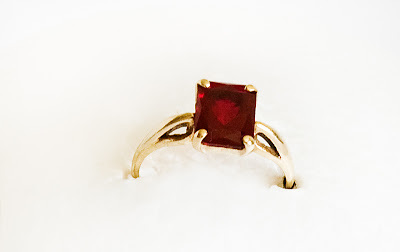 This one is 14 karat gold with a square natural garnet.